Coastal Energy provides power reticulation and street lighting services to Property Developers and Councils throughout Queensland. The Company is an A-rated service provider (the highest possible supplier rating) for Queensland’s major electricity distributors, Energex and Ergon Energy. Coastal Energy specialises in supply and installation of electrical systems such as street lighting in new subdivisions throughout Queensland. The Sale of the business was conducted by Kevin L. Sutherland – Senior International Marketing Consultant using Lloyds Tender Process in conjunction with the application of Lloyds Target Marketing produced some spirited offers which resulted in a highly successful Sale. The Investment Group have acquired 60% of the business and with management retaining the balance are looking to aggressively grow the business. Queensland businesses within the energy and infrastructure sectors are set to have a bright future, expanding yearly. The Queensland Government has outlined its 2018- 2030 plan for new and upgraded infrastructure. 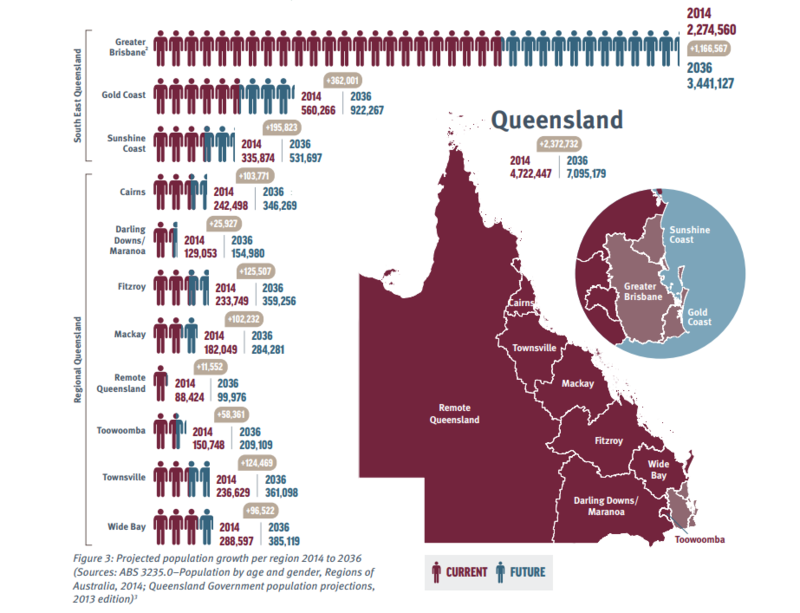 As shown below, the population growth is predicted to grow substantially throughout Queensland, especially in the major city centres. To accommodate population growth, entire suburbs of new streets and transport infrastructure will be needed. Street lighting and power reticulation services will be heavily required by state government services as new roads are laid and old ones upgraded to handle increased traffic. The Queensland government predicts that by the year 2036, QLD roads will experience close to double the amount of traffic and usage compared to 2018. The budget for infrastructure has therefore been increased proportionately, providing opportunities for businesses in the energy and construction industries. Do you own a business in the engineering, electrical or construction sectors? If you are interested in continued business growth, strategic partnerships or acquisition, talk to our Brisbane business brokers today. Click on the left navigation links to read more news and press releases.